We’ve all seen the various demos and trailers along with enduring several delays but finally Bioshock Infinite has arrived. This is one of the most incredible stories I’ve ever experienced, not just in a video game but in all forms of media. Historical Fiction has never been done on such a scale as this before. Irrational Games and its creative director, Ken Levine offers us the most memorable cast of characters, a dystopian floating air-city that quickly becomes the benchmark for visual expression and so much more in between. Infinite indeed has the makings of a timeless video game never to be soon forgotten. The primary setting for Bioshock Infinite is in a city suspended by giant balloons and blimps simply know as Columbia. Columbia, named in homage to the female personification of the United States was established and built in an alternate 1901 by then President McKinley to critical praise and fanfare as seen in the varius Kinetoscopes you find throughout the city. The city itself became disavowed after the actual international incident that was the Boxer Rebellion. The location of the city was also lost to many of the public. Isolation spread and the ultimate outcome of that isolation was civil war braking out, resulting in two factions: the Vox Populi, (Latin for “voice of the people”) led by Daisy Fitzroy and the Founders, the remains of those men who founded Columbia, led by Comstock, the main antagonist. Unlike the underwater city of Rapture from the original Bioshock, the city of Columbia itself tackles very risky concepts in its progression such as, racism, xenophobia, segregation, and even nazism expressed mostly through the Voxophones, Kinetoscopes and film projectors you find in the city itself. That being said, this does an exceptional job portraying all of these radical issues that were very prevalent in that time period. On to the main story. You play as Booker DeWitt, a former Pinkerton agent who was recently cast out due to what the plot points out as excessive gambling and drinking as a result of what he witnessed at real historical events like The Battle At Wounded Knee. Now back in the early days of the Pinkertons they were indeed feared by even the worst of criminals, so to be disgraced by that type of organization give you a clear idea of what kind of character Booker really is. In an attempt to erase his unknown amount of debt, Booker is hired to retrieve a young woman in Columbia named Elizabeth that has been held captive in Columbia for what seems to be most of her life. She is very resourceful in her studies of medicine and physics. Elizabeth also proves to be useful in lockpicking and providing you with ammunition and health whenever you may be running low. There is Songbird; a large, robotic bird creature which, in my opinion, makes the most frightening sounds ever in its pursuit of Elizabeth after her escape from the tower where she was kept. 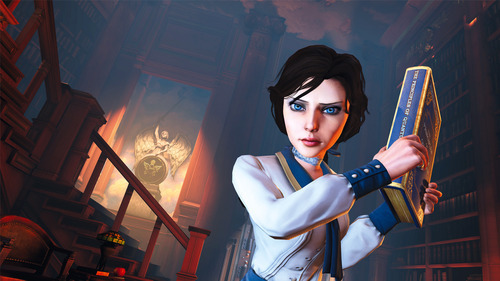 Bioshock Infinite’s gameplay is similar to the previous two games in the series, however, there are a significant number of improvements. For instance, traversing the world of Columbia can be one of the most enriching experiences since Rapture itself. On foot you can move about the various structures but the real enjoyment is on the Skyline. 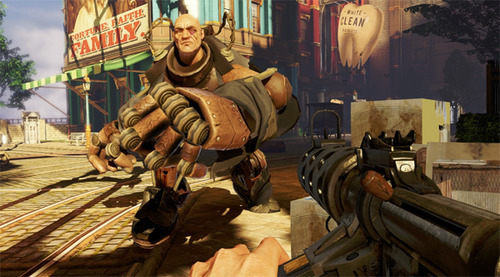 Via grappilng hook, the player can move on a series of railways connecting buildings and in first-person view, it feels like you’re actually on a rollercoaster, so much so that I found myself not wanting to get of because it was so enjoyable to ride. Aerial assassinations are also possible while on the Skyline and you can also control your speed and direction which is always a nice touch. You come across different types of gear/clothing that offer buffs to your current loadout such as more melee damage, less firearm damage taken and others. Powers are gained through vigors (which is the equivalent to Bioshock’s plasmids) that grant activated powers such as telekinesis, electrical shock, animal control (Murder Crows), and various elemental damage as well. Bioshock Infinite offers exciting gameplay, a beautiful world to explore and one of the most well told stories of this generation to match it. The historical accuracy in the visuals and dialogue are phenomenal to say the least. Not to mention the terrific voice performances by Troy Baker and Courtnee Draper and the supporting cast members as well. The shooter mechanics are so solid and responsive and it pushes the genre forward in terms of storytelling and gameplay. Just as the original Bioshock offered a timeless experience, Infinite goes above and beyond to offer the same and more. The PC version was used for this review. At this time, Bioshock Infinite costs a full $60.